The first time I read To Kill a Mockingbird it was while studying for my Junior Cert, and it remains to this day the only studied text I ever loved. So I was obviously delighted when I heard there would be a sequel. But Watchman is to Mockingbird like The Casual Vacancy is to Harry Potter, just because you like one doesn’t mean you’ll like the other. Where Mockingbird is innocent, Watchman is complex, where Mockingbird is action, Watchman is slower. If you don’t like character study and development, talking and not much else, don’t read this. 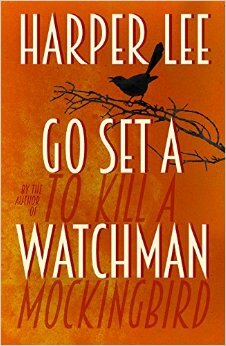 I know Watchman was written first, but it really feels like a sequel. So much of it would feel unexplained if I hadn’t read Mockingbird, so if you haven’t read it you probably should. I understand why Lee’s editor asked her to write Mockingbird because the whole novel contains these allusions to what can only be a fascinating untold story. The novel deals with the idea of rationalising racism, which is still a relevant idea today unfortunately. Characters like Atticus and Henry fell they are totally justified denying black people their humans rights and treating them as less than equal citizens for a number of convoluted reasons, some that people still try to use today. It’s quite upsetting to watch otherwise intelligent and kind people try and justify cruelty towards others, and the fact that it’s just as topical and prevalent now as when Watchman was written really makes you despair for humanity. Lee also deals with the fallibility of our role models. Through Jean Louise’s relationship with her father, we explore the idea that there is no greater heartbreak than finding out someone you looked up to is wrong sometimes. We’ve all had a moment when we realised our parents or other role models didn’t know what they were talking about, but Jean Louise’s is particularly traumatic. Atticus, a paragon of goodness in her eyes, falls as she realises that his compassion only stretches so far. One thing I’m sure about Watchman is that Lee writes children like no other. No other writer I’ve ever read has captured childhood and the minds of children quite like Lee, which is probably part of the reason Mockingbird was such a success. Her writing is beautiful, and I wish there was another book of hers I could read. Overall, just because you liked Mockingbird doesn’t mean you’ll like this. But I’d give it a go anyway.